Although less well known than Hiscock’s Make Your Own Electric Guitar, Martin Koch’s Building Electric Guitars – How to Make Solid-Body, Hollow-Body and Semi-Acoustic Electric Guitars and Bass Guitars is a fine work with excellent content and its own approach. It was my primary reference while building my first guitar project so I had the opportunity to use it in depth. Like any good book on the subject, it covers all the expected areas: the nature of wood, basic tools needed during construction, building the guitar body, making the guitar neck, routing pickup and control cavities, etc. Koch accomplishes this in straightforward language in combination with a generous number of photos. It’s ideal as a workshop reference. However, don’t expect a master course in guitar finishing. Koch focuses on construction and appropriately sticks to basic finishing involving the use of Danish Oil and wax. Koch’s book does add an interesting twist not found in Hiscock’s Make Your Own Electric Guitar. It actually covers, albeit briefly, headless guitars! My first build was a headless guitar and this was one of the first references I found that even addressed their existence. It was encouraging to go into my project with this book at my side. So, do I recommend the book? Absolutely. 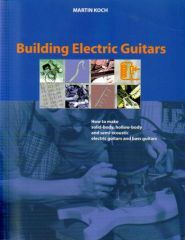 Martin Koch’s Building Electric Guitars covers the essentials well, includes coverage of headless guitars (an important topic at BTEG) and successfully guided me through my very first guitar project. Anyone getting started in electric guitar making will benefit from it. And for those who prefer an electronic format, Koch’s guitar making book is also available as a PDF ebook. Also my first building purchase. I can’t say that I have finished a guitar “proper” yet, but Koch’s offering also provided links and info for a very simple and accessible lap-steel build, which I DID complete. Like the Hiscock book, the pictures could be updated and improved, but they’re still quite usable and useful. Agreed, Greg. I’d like to see updated editions of both books but it is a niche subject after all. However, that’s not to say it can’t be done. Printing costs continue to drop and it’s becoming increasingly easy for small runs of books to be done so who knows what the future might bring.